Smaller, lighter, brighter and stronger than ever before, the latest Vortex Razor HD 10x42 binocular offers the ultimate combination of advanced technologies and premium components. Packed with the best-quality, hand-selected prisms and premium HD (High Density) extra-low dispersion glass available today. APO Optical system combines with HD (High Density) glass for unmatched colour sharpness. HD Lens Elements Premium (High Density) extra-low dispersion glass delivers the ultimate in resolution and colour fidelity, resulting in High Definition images. Dielectric Prism Coatings Multi-layer coatings provide the clearest, brightest, most colour-accurate images possible. XR Lens Coatings Vortex proprietary XR anti-reflective coatings, fully multi-coated on all air-to-glass lens surfaces, increase light transmission for maximum brightness. Phase Correction, used on roof prism models only - coating enhances resolution and contrast. Roof Prisms valued for greater durability and a more compact size. Magnesium Chassis decreases weight and increases strength. 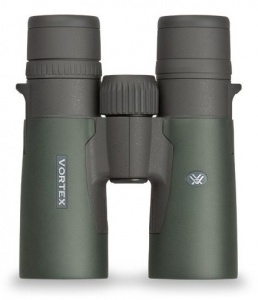 Waterproof Optics are sealed with o-rings to prevent moisture, dust, and debris from getting inside the binocular. Fogproof Argon gas purging guarantees superior fogproof and waterproof performance. Rubber Armour provides a secure, non-slip grip, and durable external protection. Multi-Position eyecups twist up and down to precise, intermediate settings to maximize custom fit for comfortable viewing with or without spectacles. Centre Focus wheel adjusts the focus of both binocular barrels at the same time. Locking Diopter adjusts for differences in a user's eyes. Located on right eyepiece.